Building muscle requires protein and energy, and for this reason, mass gainers contain a mix of protein and carbohydrates. Gaining is always a compromise between putting on fat and muscle, and just like almost any trait you can think of, there is a lot of variety between people. Some people are hardgainers and find it very difficult to put on weight, and there are mass gainer formulas designed for them that contain huge amounts of carbohydrates for energy. Other people lie at the other end of the spectrum, and have a tendency to put on fat rather than muscle. This increasingly becomes the case for many people as they age, while others are natural endomorphs and have a body type with a tendency to put on weight as fat. The good news for these people is that there are a number of great, lower kilojoule products on the market. These mass gainers deliver the good quality protein required for muscle growth with less energy than a traditional mass gain product, helping these people put on bulk, not fat. Here are five of the best. 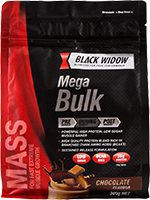 #5Black Widow Mega Bulk is a simple, no frills formula from an Aussie company who are known for making excellent value, high quality products. Like other low calorie mass gainers, Mega Bulk has close to a 1:1 ratio of protein to carbs, and contains just shy of 38g of each in every 90g serve. Maltodextrin provides the carbohydrate content in Mega Bulk, and the protein is predominantly whey concentrate, with a small amount of isolate. Black Widow have also thrown in Taurine and Glutamine, two amino acids which support muscle growth. With a basic formulation, and as one of the cheapest low calorie mass gainers on the market, Mega Bulk is a great place to start. #4 Widely considered one of the best tasting proteins available, Musashi Bulk is very similar to Mega Bulk, but takes it up a notch with the addition of vitamins and minerals, and the use of both dextrose and maltodextrin as carbohydrate sources. These fast acting carbs make Bulk a great product after a workout and the slow deliver long lasting energy. Bulk packs in 26.6g of protein and 23.4g of carbs per 60g serve. In keeping their product simple, Musashi have kept the price down on Bulk, and this is a classic product that represents excellent value. #3Gentec Pro Mass comes in at third place, with a more complex, cleverly designed formula. The protein predominantly comes from whey concentrate, with whey isolate and skim milk powder, adding faster and slower digesting protein sources respectively. Similarly, fructose and maltodextrin deliver faster and slower digesting carbs. Pro Mass also packs significant fat calories, in the form of Medium Chain Triglycerides, a type of lipid that has been praised for its ease of digestion and health benefits. Added creatine helps to bulk up the muscles, and many believe colostrum can boost HGH levels. Gentec Pro Mass covers a lot of bases and is a solid choice. #2Ultimate Nutrition Iso Mass is the mass gainer that does everything, sharply contrasting some of the very simple products on this list. With five sources of protein and six types of carbs, six healthy fats, extra muscle boosting amino acids, a full range of vitamins and minerals, NO boosters, seven forms of creatine... well, you get the picture. This is all packed into a huge 157g serving size which delivers 60g worth of protein and almost the same again in carbs. This super comprehensive formula may be too complex for some, but for the more serious or advanced gainer, Iso Mass is a very impressive all-in-one product that will meet their muscle building needs, probably addressing some they never even knew they had! 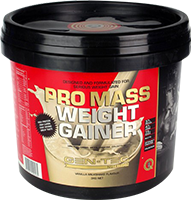 #1 The number one protein company in the world obviously got there by doing something right, and Pro Complex Gainer is a great example of the formulation and product quality that go hand in hand with the Optimum Nutrition brand. Sporting a huge spectrum of different protein and carb sources to maximise the body's absorption, a healthy blend of fats, and a comprehensive array of vitamins and minerals, this product is suitable for everyone, and the big 160g serving packs 60g of protein alongside 85g of carbs. The incorporation of pre-dosed supplement components like creatine and NO boosters renders supplements like Iso Mass incredibly convenient, but ultimately less versatile than Pro Complex Gainer, which provides near-unadulterated source of the macronutrients needed to put down clean bulk. This is a top of the range product that has been helping people to pack on muscle and minimise fat for years, and will continue to do so for many years to come.